Most utilities use coal, #6 oil, nuclear power, or water as their major source of energy. Number 2 diesel or kerosene is used as a fuel to power smaller jet engines for combustion or gas turbines used at peak periods of demand. Diesel fuel is also used to light off coal-fired, or #6 oil-fired boilers to get them up to operating temperatures prior to using less expensive coal or #6 oil. Another use of #2 diesel is for emergency power equipment in the event that primary power fails. Whatever the primary fuel is at a utility, #2 diesel is usually stored in significant quantities for one of the above reasons. Since #2 diesel is often a secondary or even a tertiary fuel, most power engineers and fossil fuel managers have given little attention to the problems of storage and efficient combustion of diesel fuel until now. Environmental issues dealing with smoke, toxic emissions, storage tanks, and growing competition have forced utilities to look at all of their costs. This has created a market willing to discuss a means of improving efficiency. Until recent years diesel fuel was a fairly reliable material. As the demand for middle and light distillates grew, refiners had to change their methods of making these products in order to reduce more of them from each barrel of crude oil. This change was to take heavier oils from the crude and catalytically crack them to produce an oil that met the ASTM specifications for a #2 fuel. "Cat-cracking" created more middle distillate. However, instead of a stable, dependable product we have a product that wants to change itself back to heavier, longer molecular chain materials. These longer chain polymers of diesel fuel are infinite in their configuration and manifest themselves in fuel as gums, varnishes and other particulate. It is this and other particulates that continue to agglomerate forming macroscopic (bigger) particulate that would plug filters, burn with smoke, and leave a carbon residue throughout the combustion system. It is also this particulate that has accelerated the formation of sludge in tanks, increasing the need for tank maintenance. Bacteria and fungus have always been a concern with fuel storage. Micro-organisms combine with sludge, compounding all of the problems described. Water through condensation and from transportation accumulates in a tank. Water brings bacteria which will use the hydrocarbon in fuel as nutrients. Water further compounds filter plugging problems. In winter, water freezes, causing more plugging problems. Wax is a natural component of petroleum fuels. In cold weather wax crystals will form and agglomerate, mixing with water, polymer of fuel, and bacteria to further shut down the fuel pumping process. Oxidation is a slow natural process of fuel degradation that also produces solids. Other than water, all of the "bad guys" mentioned above are solids generated from the fuel or water that comes with the fuel. Our mission has been to prevent these solids from forming or agglomerating, maintaining a useful, reliable fuel. 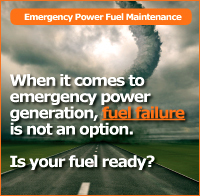 Certainly since #2 fuel is usually called on in peak or emergency periods of demand for power, reliability is paramount. The solution to the solids problem in fuels is a complex one. Starting with a clean tank and new fuel we recommend testing the fuel twice per year to determine the condition of the fuel, including its potential to generate solids. 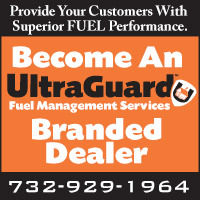 If the fuel is found to be free of excessive bacteria and sediment, then a protective maintenance dose of a full package of inhibitors such as UltraGuard™ is recommended to retard oxidation, repolymerization, and micro-organism growth. This product will not encourage the emulsification of water and fuel. If the fuel is active and producing solids, then the appropriate dosage rate and blend of chemical will be recommended to stabilize (stop the production of solids) and break up existing sediment. If the tank is not clean and the existing fuel is tested and found to be active, then the appropriate chemical treatment to stabilize the fuel, break up the existing agglomerates, and kill microorganisms will be recommended. 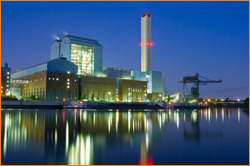 Some utilities look to filtration to solve particulate problems. Filtration is a solution only when inorganics are the contaminant. Inorganics would be sand, dirt, or rust, for example. Organics are the microorganisms and polymers of fuel that typically form sludge. Therefore, filtration is a costly remedy that provides only temporary benefits. Corrosion inhibition of storage tanks and all metal components that are in contact with fuel. A "cleaner" fuel (free of solids) burns more efficiently, saving fuel cost and minimizing controlled emissions. The cleaning characteristic of the chemical used will keep injector nozzles clean and free of the carbonaceous residue, providing further fuel efficiencies and maintenance reduction. All of our chemical solutions are compatible with middle distillate fuels, #2, #1, kerosene, and jet fuels. Our products are 100% miscible in fuel and are therefore easy to "get into the fuel."